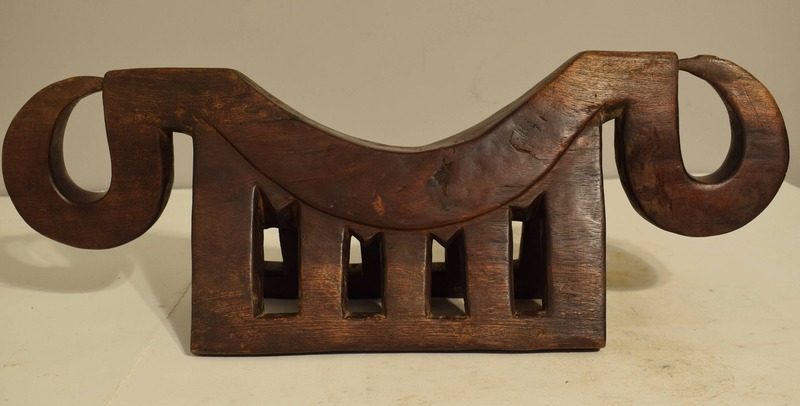 This is a beautiful Carved Wood Zoomorphic Shaped Dinka Headrest or Stool from the Dinka Tribal People Northwestern Congo. 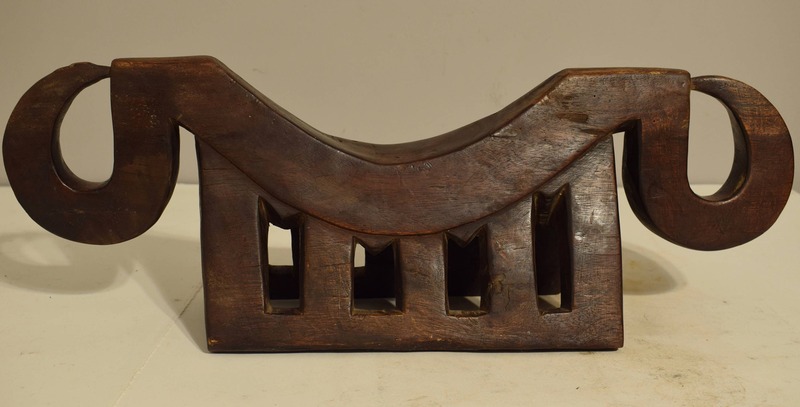 This headrest is carved out of a single piece of wood. The lifestyle of the Dinka is that of the nomad and herders. Today Dinka people raise cattle and practice agriculture. Little is known about their art. However, Dinka personal and body adornments are among the most astonishing on the all continent. The Dinka nomadic lifestyle is reflected in their art. The Dinka have excelled in the production of small objects, easy to carry. Stools and headrests are among these precious objects. Dinka headrests or neck rest are carved from a single piece of yellowish brown wood and consist of three to four-legged stable feet. In most of the cases the entire piece is made from one single piece of wood. The upper level parts have various forms and usually narrow curved with rounded corners, slightly concave along its length and convex across its width, with a convex underside. Some have zoomorphic motifs which include birds, antelope, and giraffe. These stools and headrests are known as thoch (stool), and used as a headrest and seat by both old men and women. They are also used to protect elaborate coiffure. In the Dinka society and neighboring peoples, headrests like this are very personal. They are believed to house the soul of the owner. This would truly compliment your collection or home.